How many years does it take for a newly planted orchard to product a first crop? There are many variables, but it typically takes 4 years to harvest a crop. 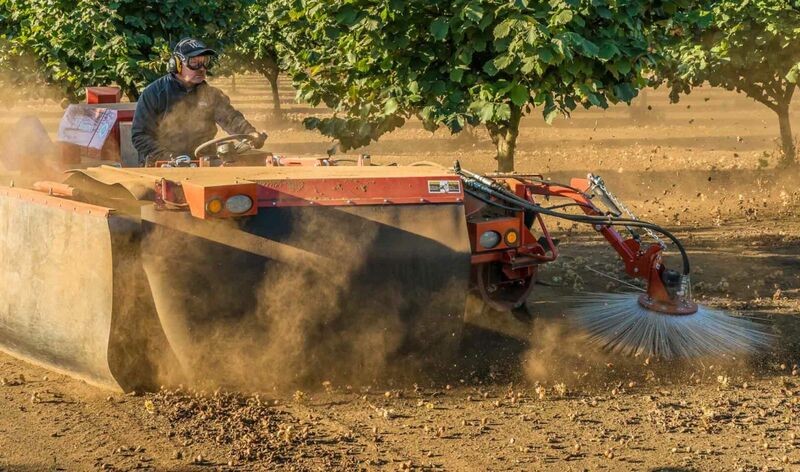 How many acres do you need to plant to make it worth the investment in equipment to harvest and grow hazelnuts? It takes approximately 30 acres to warrant the investment in expertise and equipment. There are many different custom harvest operations available to growers who plant less than 30 acres. For efficiencies sake, having less than 10 acres in one area can be more of a challenge. What should I know when planting hazelnuts? Talk to an Agronomist with Valley Agronomics to get specifics. It is important to have the correct soil type favorable for hazelnuts to grow. Drainage is also a critical component as hazelnut trees do not do well in wet soil. An Agronomist can also help with soil tests before planting to confirm proper pH and nutrient levels. They can also help with tips on nutritional needs and weed control measures. When are hazelnuts typically planted? Orchards are typically planted in the fall or early winter months. Why do some orchards have trees planted closer together than others? Most orchards are planted on a 20’x20’ spacing. There are some orchards planted with a double density of 10’x20’ to get quicker return from their investment. However, after 9-10 years those orchards will be thinned to remove every other one because of tree crowding. Hazelnuts naturally fall to the ground in September and October depending on seasonality and tree variety. The nuts are then swept into a row and picked up by machine in prep for washing and drying.